A pilot has resigned from South African Airways (SAA) after flying for more than 20 years with a fake licence. SAA said it discovered William Chandler's paperwork was forged after a "reportable incident" during a flight from South Africa to Germany. The airline has filed criminal charges and is seeking "millions of rand" from Mr Chandler. A safety officer at SAA has also been suspended for allegedly trying to cover up the forgery. South African newspaper the Mail & Guardian (M&G) reported that Mr Chandler worked as a flight engineer at the state-owned SAA before getting a job as a pilot in 1994. He was a Senior First Officer, a role where he was a monitoring pilot but did not command any aircraft. Sources told the M&G that he was, however, in control of a plane that "made some strange turns" after encountering turbulence over the Swiss Alps. SAA said in a statement that, after investigating the incident, it found Mr Chandler had only a commercial pilot's licence. He later resigned. Airlines require pilots to have an airline transport pilot licence (ATPL) for long-haul international flights. For an ATPL, pilots must pass several technical and medical exams and complete 1,500 hours of flying time. Licence-holders must "refresh" their credentials every year in a series of tests involving flight simulations and physical exams. The certificates are awarded in South Africa by the country's civil aviation authority (SACAA). "What seems to have happened here is that the pilot would have taken what we have issued to them... and would have changed those documents to give an impression that they are in possession of an ATPL," said Phindiwe Gwembu, an SACAA spokesperson. Tlali Tlali, a spokesperson for SAA, said that the alleged fraud was "disconcerting" but had not posed "any safety risk" since Mr Chandler was still in possession of a flying licence and had completed safety training. Mr Tlali added that "necessary steps will be taken to recover the money unduly paid to him" including salary, overtime and allowances. SACAA said it was investigating any "loopholes" in its practices. 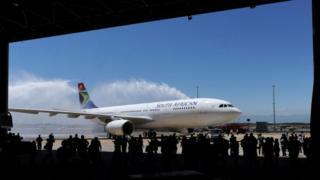 In a statement, the SAA also said it had submitted the licences of all its pilots to the SACAA for evaluation, and would obtain licences from examination bodies from now on, rather than from individuals. The airline, one of Africa's largest, has lost money every year since 2011, and survives on government support. Last November, South Africa's finance minister Tito Mboweni told a US investor conference that the firm should be shut down. But President Cyril Ramaphosa has pledged to revive it.